What can I say about the Jive Kings? It was the beginning to so many other beginnings. It lead to so many events and experiences and people and contacts and recognition. It was a wonderful three year experience that started as a hometown coverband and grew to become a popular touring act all over the Maritimes and Quebec and Ontario. 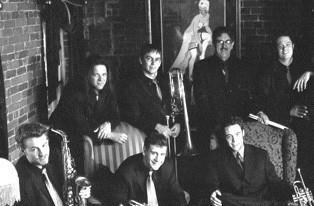 We were fortunate enough to be nominated three consecutive years for an East Coast Music Award, winning in 2000 and 2001 for Jazz Group of the Year. Indian River Festival 2001 with Jene Stillwell and performance of "Rhapsody in Blue"
Ah yes...the Jive Kings...experiences too many to name!